Kate Frye had first joined a suffrage society in the spring of 1906. Her choice was the Central Society for Women’s Suffrage (later renamed the London Society for Women’s Suffrage) – a constituent society of the National Union of Women’s Suffrage Societies Interest in the long-running women’s suffrage campaign leapt ahead in the following few months and in February 1907 the NUWSS staged the first open-air suffrage spectacular – a march through the wintry, muddy London streets. For obvious reasons this became known as the ‘Mud March’. Kate’s estimate of 3000 participants accords with later reports. In bed for breakfast – and what was my utter disgust – and disappointment – to hear the torrents of rain – and there was not a shadow of its coming last night – it was bitterly cold. As it was so heavy I hoped it would stop – but it went on and on into a fine heavy drizzle. They said I should be mad to go in the procession and though I knew I must – I went out at 12.30 taking Mickie a walk and sent a telegram to Alexandra Wright telling her the rain prevented my joining them. I had arranged to be at their house at 1 o’clock and go with them to Hyde Park. We all had lunch. I knew I was going all the time – but couldn’t go. Off to wash my hands. 2 o’clock. ‘They will be just starting’, said I. Then as I washed I made up my mind I would go rain or no rain and – lo – the rain had ceased. I prepared a plan to Agnes. She too knew she was to be of it – both flew upstairs and were out of the house before 2.15. We tore to Notting Hill Gate – meaning to go the quickest way. No motor bus – so we tore for the train – it came in as I started to race down. In we scrambled – had to change at South Kensington much to our disgust – but we were not kept long. We flew out at Charing Cross and up Villiers Street. No sign of the Procession of Women Suffragists in the Strand. They were timed to leave Hyde Park at 2 o’clock so I had to pluck up my courage and ask a policeman. No, they had not passed. So, knowing the route, we flew up as far as Piccadilly Circus and there in about 2 minutes we heard strains of a band and waited, anxious and expectant. The crowd began to gather and we were nearly swept away by the first part – a swarm of roughs with the band – but the procession itself came – passed along dignified and really impressive. It was a sight I wouldn’t have missed for anything – and I was glad to have the opportunity of seeing it as well as taking part in it. We stood right in front so as not to miss our contingent – and I asked if they knew where it was. Miss Gore Booth said it was coming and we were fearfully excited and I was so anxious not to miss our lot. I shrieked out when I saw Miss Doake’s red head in the distance and we dashed up to them and asked if we could join in. Alexandra carried our banner. Mrs Wright said come along here – it felt like boarding an express train but I suppose it was a quite simple rally though I cannot look back on it as that – but we were so excited and so anxious not to miss them. We walked three abreast – Miss Doake, Agnes and I – I was on the kerb side – behind us Gladys [Wright], Miss Ellis and Mrs Doake. North Kensington was not very well represented but I really do not know who else of us was there. Then the real excitement started. The crowds to see us – the man in the street – the men in the Clubs, the people standing outside the Carlton – interested – surprised for the most part – not much joking at our expense and no roughness. The policemen were splendid and all the traffic was stopped our way. We were an imposing spectacle all with badges – each section under its own banners. Ours got broken, poor thing, unfortunately, and caused remarks. I felt like a martyr of old and walked proudly along. I would not jest with the crowd – though we had some jokes with ourselves. It did seem an extraordinary walk and it took some time as we went very slowly occasionally when we got congested – but we went in one long unbroken procession. There were 3000 about I believe. At the end came ever so many carriages and motor cars – but of course we did not see them. Lots of people we knew drove. Up the Strand it was a great crowd watching – some of the remarks were most amusing. ‘Here comes the class’ and two quite smart men standing by the kerb ‘I say look at those nice girls – positively disgraceful I call it.’ Then ‘Ginger hair – dark hair – and fair hair’ ‘Oh! What nice girls’ to Miss Doake, Agnes and I. Several asked if we had brought our sweethearts and made remarks to express their surprise at our special little band. ‘All the prizes in this lot’ etc. The mud was awful. Agnes and I wore galoshes so our feet were alright but we got dreadfully splashed. 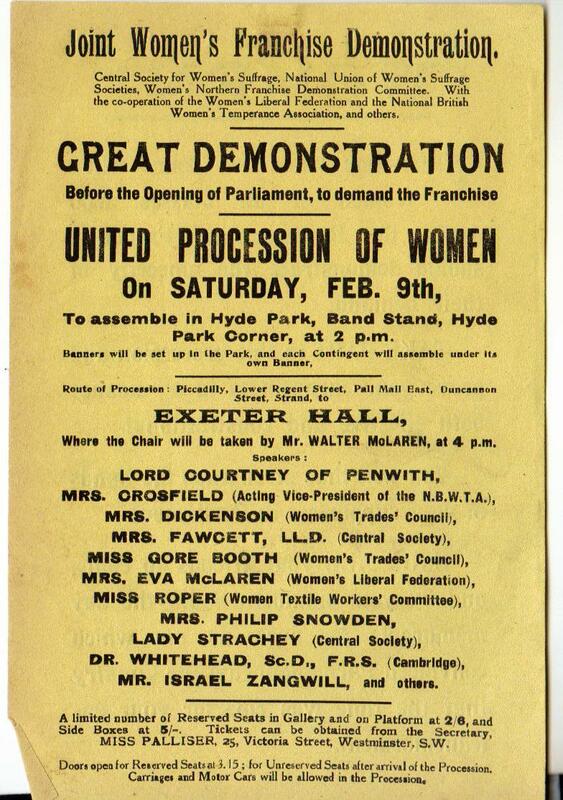 It was quite a business turning into the Exeter Hall. A band was playing merrily all the time – the one which had led the procession – and there was one not far off us. Three altogether, I was told. We got good seats and of course had to wait some time before the meeting started – it was just after 4 pm when it did – but there was a ladies’ orchestra performing and playing very well and a lady at the organ in between whiles. The meeting was splendid. Mr Walter McLaren in the Chair and Israel Zangwill as chief speaker – he was so splendid and most witty. 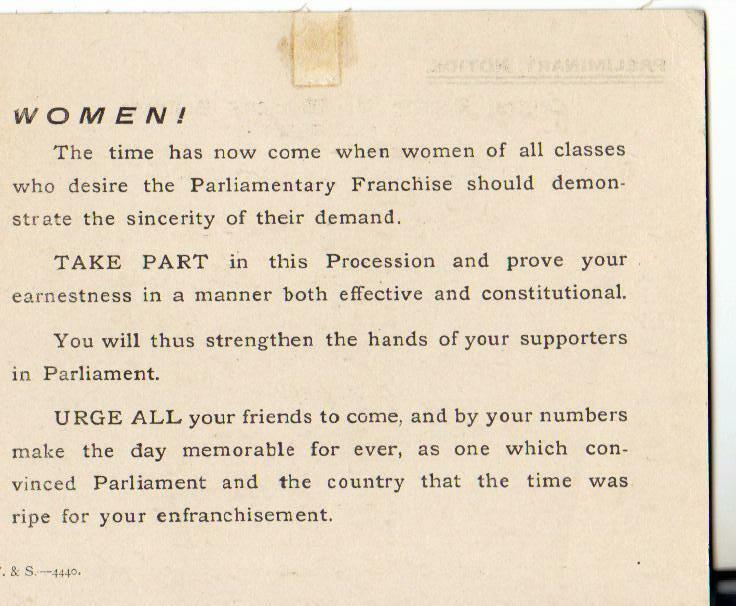 Miss Gore Booth – Mrs Fawcett – Mrs Eva McLaren – Lady Strachey and several other ladies spoke and Keir Hardie made an excellent speech. It was altogether a wonderful and memorable afternoon – and felt we were making history – but after all I don’t know, I am sure, what will come of it. The MPs seem to have cheated and thoroughly ‘had’ us all over it. They wanted the Liberal Women’s help to get into the House and now they don’t care two straws or they are frightened of us. We walked up to Tottenham Court Road and came home by bus. It was nearly 7 o’clock when we got in. .. I felt bitterly tired all the evening after the excitement. Alexandra and her sister, Gladys, lived at 10 Linden Gardens. It was under their influence that Kate had joined the London Society for Women’s Suffrage. Violette Mary Doake (b 1888) her parents were Irish, which may account for the red hair. Her mother, Mary Elizabeth Doake, was also a suffragist. Her father, Richard Baxter Doake, described in the 1911 census as a ‘tea planter’, was elected as a Progressive party member in 1892 to the LCC seat relinquished by Frederick Frye. In 1901 the Doakes lived at 24 Stanley Gardens, close to the Fryes. By 1911 they had moved to 25 Ladbroke Gardens. 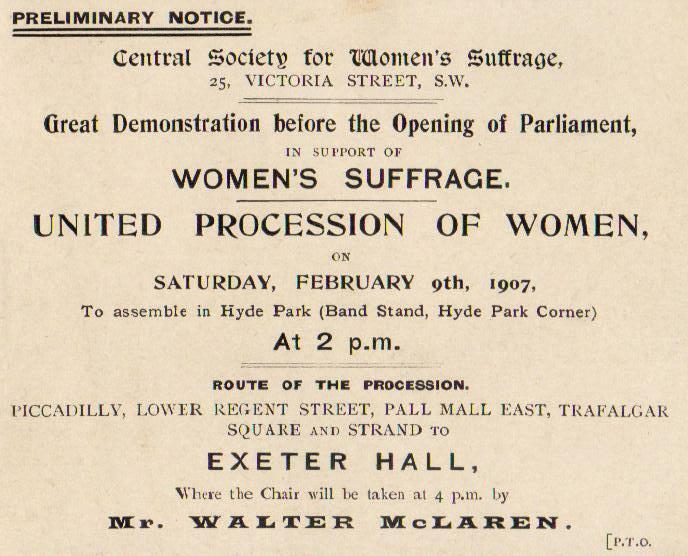 Walter McLaren and his wife, Eva were members of a family of long-standing supporters of women’s suffrage. He had been Liberal MP for Crewe in the 1890s and regained the seat in 1910. Lady Strachey had worked for women’s suffrage since the 1860s. She remarked that after this march she had to boil her skirt. Wrap-around paper covers, 226 pp, over 70 illustrations, all from Kate Frye’s personal archive. Copies available from Francis Boutle Publishers, or from Elizabeth Crawford – elizabeth.crawford2017@outlook.com (£14.99), or from all good bookshops. You can also listen here to a Radio 4 programme as Anne McElvoy and I follow the route of the ‘Mud March’. This entry was posted on November 21, 2012, 9:35 am and is filed under Kate Frye's suffrage diary. You can follow any responses to this entry through RSS 2.0. You can leave a response, or trackback from your own site.